Our focus is on biopolymer engineering to understand structure-function relationships, with emphasis on studies related to self-assembly, biomaterials engineering and regenerative medicine. Kaplan lab has extensively studied silk-based biomaterials in regenerative medicine, starting from fundamental studies of the biochemistry, molecular biology and biophysical features of this novel class of fibrous proteins. These studies have led to inquiries into the impact of silk biomaterials on stem cell functions and complex tissue formation. 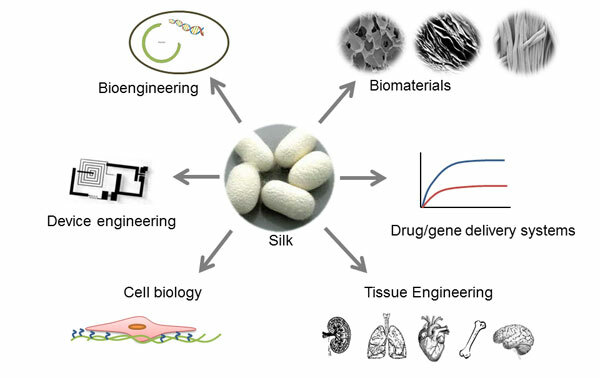 The result has been the emergence of silk as a new option in the degradable polymer field with biocompatibility, new fundamental understanding of control of water to regulate structure and properties, and new tissue-specific outcomes with silk as scaffolding in gel, fiber, film or sponge formats. Additional technological directions in optics, electronics, adhesives and many related areas have emerged from these studies.